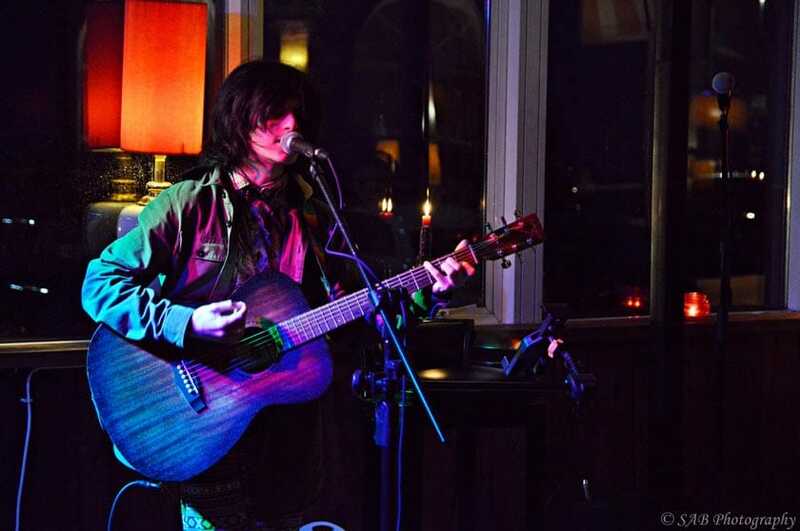 Bournemouth not only possesses a gorgeous coastline and vibrant nightlife, but Bournemouth’s open mic scene is one of the best the South Coast has to offer. With new bars and music venues popping up all over, there’s definitely a buzz about Bournemouth. Perfect for experienced performers or beginners looking to get their feet wet. 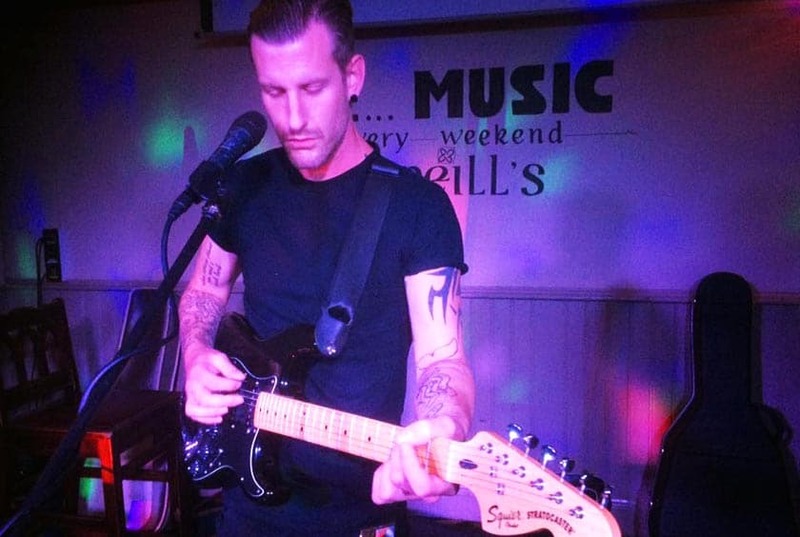 Open mic nights in Bournemouth are mostly on Mondays Tuesdays, Wednesdays and Sundays. 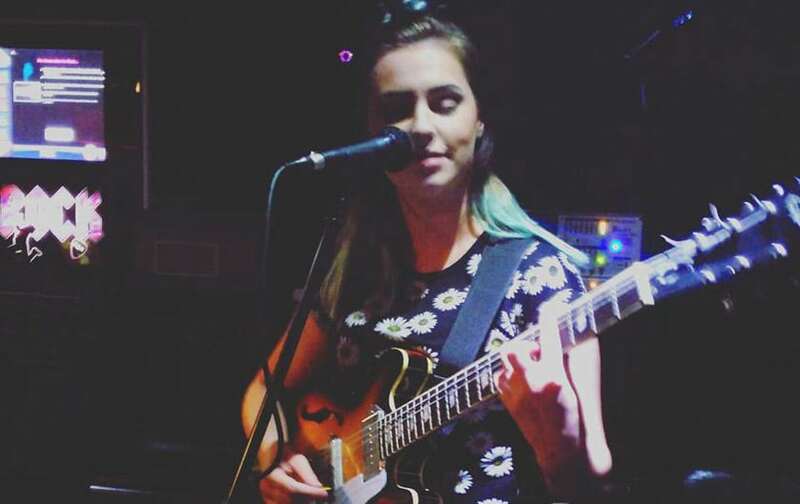 Click here for all you need to know about Open Mic nights and how they work. Looking for an open mic night in Bournemouth? In no particular order, these venues attract the best of the city’s breakthrough musical talent. Recently relocated to Lansdowne, Buffalo Bar is famous for its regular live music events, DJ sets and Jam Sessions, and they’re looking to continue that tradition in a new home. Their original open mic was one of the longest-running in the town and attracted a colourful assortment of local characters. Click here to see the dedicated photography book which features black and white images from the original venue. This night is generally an informal, chilled affair with a good mix of experienced musicians, absolute beginners and everyone in between. Rab (of Dead Lettuce fame) is the evening’s host; a jolly, ginger Irishman with a welcoming attitude who’s happy to provide back-up if required. There’s an acoustic guitar and a 4 track mixer with two microphones available for use, and they see solo guitarists, full bands, stand-up comedians and poets come through the door weekly. The usual free drink for all performers is on offer. Hosted by Si Genaro who dubs himself a “semi-professional indoor busker” with assistance from Nacho Jase, this weekly affair has garnered a dedicated following and created some very memorable evenings. The setup is simple, with three mics across the stage, an acoustic guitar available for use, plus an in-house PA and a stage monitor. Nacho is happy to accompany on bass if required. Jamming is encouraged and all bands and performers are welcome. Acts are allowed 3 tracks, and if you fancy performing, just make sure you arrive early to get your name down on the board, as these nights do get really busy. Zephyr is a classic rock bar with a difference. Records decorate the walls, the lights are dimmed—this is a venue dedicated for music lovers by music lovers. There are pool tables, a jukebox, reasonable drink prices and really good music on tap, with ZOM.B (Zephyr Open Mic Bournemouth) being an active and engaging twice-monthly event. You’ll find all styles of music represented, but expect big guitar sets and a headlining act to get the crowd warmed up. This is great opportunity to dazzle a receptive audience with your artistic excellence, plus there’s a free beer for all performers. 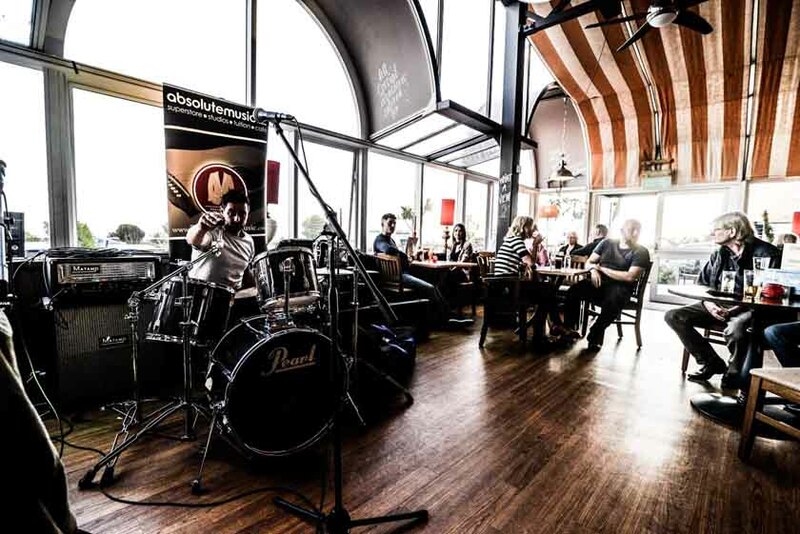 A fashionable English pub on the coast with stunning sea views, these nights are hosted by professional musicians who know how to get the most out of an open mic session. Anyone can show up and have a slot; guitars, keyboards, ukuleles, accordions are all welcome. The hosts provide microphones and a PA system, so all you need to bring is your instrument and your voice. This is real jam for blues musicians and blues lovers. Bands are put together based on attendance, and it’s a great opportunity to network with like-minded musicians. Just bring your voice or instrument, all the equipment is provided including; amps, keyboards, mics, lights, and drums. If you can play twelve-bar blues on any instrument, there will be something here for you. A small venue with massive atmosphere, Chaplin’s attracts a wide range of local talent from different artistic and musical backgrounds. Eclectic and a little bit different, this is an ideal night for newcomers to give it a go or for seasoned performers to try something new. Hosted by Si Genaro, the last open mic of the month takes place on the Cellar Bar stage, which is a fantastic opportunity to show your stuff. Display your musical talents to the accompaniment of some well-tuned acoustic instruments, the more obscure the better. Edward Fox, compères the evening and plays to warm up the crowd, with the evening often turning into a good old-fashioned knees-up. Most performers tend to be acoustic guitar and unaccompanied singers, but they also have poetry and monologues on occasion. No amplification needed, there’s a piano, guitar or ukulele available to use and a high ceiling to help magnify vocals, but they do provide a microphone if needed. Beat the Monday blues and swing by for this weekly open mic night led by local singer-songwriter Lee Rasdall-Dove. 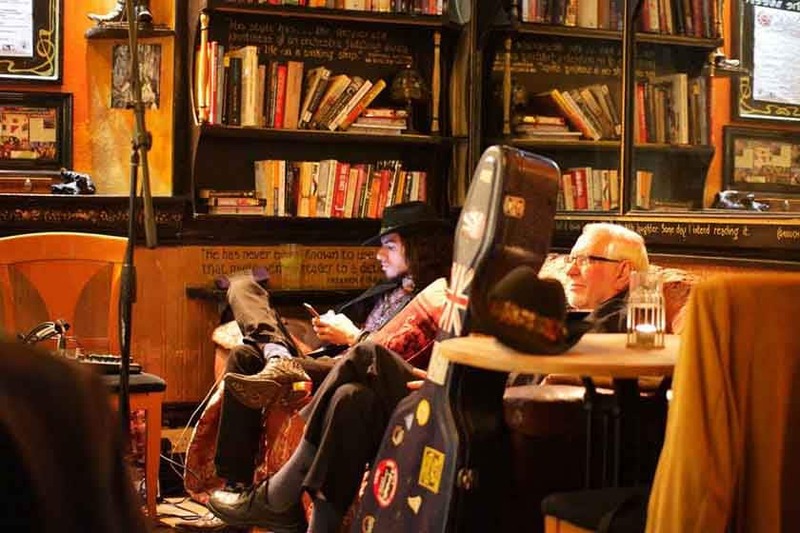 A lovely pub with a modern twist located in The Triangle, good music is the heart and soul of this venue and its influence is seen everywhere, from vinyl menus to sheet music adorning the walls. This is a turn up, plug in and play style event, with acoustic bands and solo acts all welcome. A house cajón is available, plus there’s usually a weekly guest star showcase. There’s a free drink for performers from a well-stocked bar, with one lucky artist a month invited to headline a Monday night of their choosing. 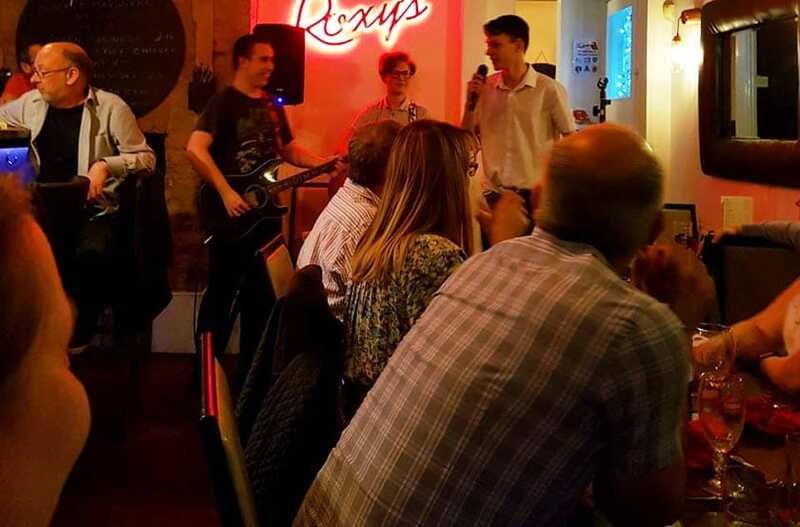 Always a fun evening, Roxy’s Open Mic and Quiz night has been running for about a year now with musician and host Calvin Glen at the helm. Local musicians are encouraged to perform in a laid-back and friendly atmosphere, where the ethos is about meeting new people, building self-confidence and networking with fellow artists. A full PA system is provided, with microphones, jack cables and stands. It’s often packed and lively, but the audience is respectful while an act performs (you could hear a pin drop sometimes). You never know who will show up on the night, they’ve seen pop, rock, metal, musical theatre, folk, and even people playing the flute and violin. Meet & Sip is a coffee shop during the day which turns into a cocktail bar/lounge in the evening. With a late licence till 1 am, in the evenings they turn the place into a relaxing cocktail lounge with classic cocktails on demand. The Platform has a very chilled vibe and welcomes new talent of all ages and styles into their whimsical and inclusive space. All acts are welcome, performing whatever you desire; poetry, music, comedy, storytelling or dance… anything goes in this safe space for free thinkers. So, now you know where to perform in Bournemouth, there are no excuses to get out there and get performing! Have you considered entering Open Mic UK? Auditions are coming to Bournemouth!